As we humans have expanded our horizons to see things vastly smaller, faster, larger, and farther than ever before, we have been forced to confront preconceptions born of the human experience and create wholly new ways of looking at the world around us. The theories of relativity and quantum physics were developed out of this need and have provided us with phenomenal, mind-twisting insights into the strange and exciting reality show of our universe. 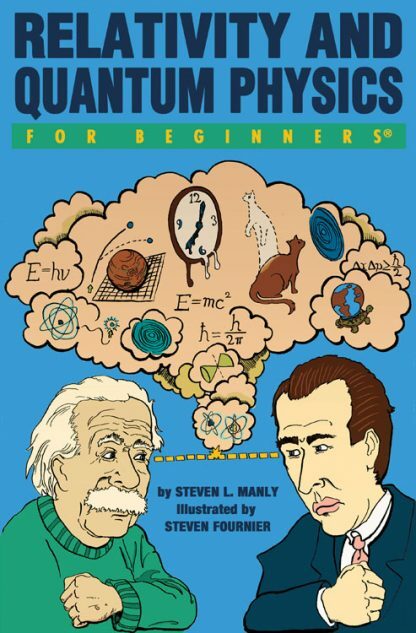 Relativity and Quantum Physics For Beginners is an entertaining and accessible introduction to the bizarre concepts that fueled the scientific revolution of the 20th century and led to amazing advances in our understanding of the universe. Steven Manly received an undergraduate degree from Pfeiffer College and a Ph.D. in high energy physics from Columbia University. He moved up the faculty ranks at Yale University before moving to the University of Rochester, where he now resides and terrorizes students in the introductory physics course sequences. Professor Manly works on experiments at high energy accelerators around the world where his research probes the structure of matter and the forces of nature. Recently, he was named the recipient of the 2007 Excellence in Undergraduate Teaching Award by the American Association of Physics Teachers. Steven Fournier was born and raised in Massachusetts. Amidst the 10 years he spent carousing throughout Boston, he earned a BFA degree in Illustration and Animation from Massachusetts College of Art and Design, played music with friends, and became handy with a Chef's knife. His current projects include (but not exclusively) apprenticing to be a tattoo artist, making photocopy comic book zines, training his hand to draw in his sleep, and playing country cover songs on his guitar.